Five years ago, Jim and Meredith Howard bought a 1971 slab house with a flat concrete-paved backyard in the San Francisco Bay area and began transforming it into a habitat garden. They wanted to create an interesting and functional space that attracted native birds and insects, learn the local native plants, improve drainage, and do it all on a budget and without wasting materials or hauling truckloads to the landfill.At a recent Gardening with Natives talk, Jim Howard showed how they did it. As the District Conservationist for the USDA Natural Resources Conservation Service in San Mateo County, Howard is attuned to nature but was new to the bay area. 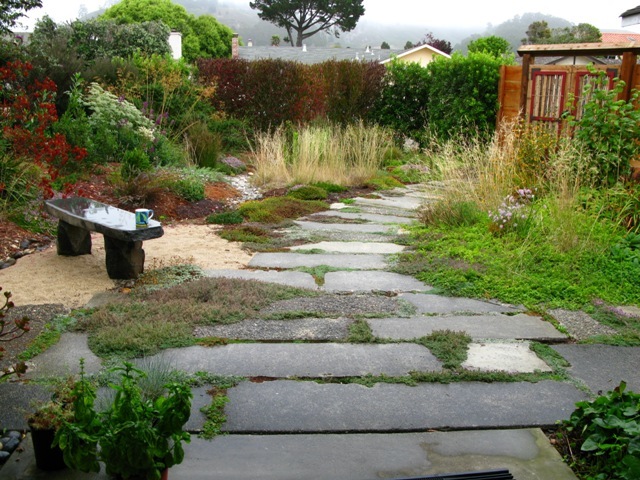 Starting with the front yard, they consulted with Acterra, a restoration nursery, to choose appropriate native plants. Since the goal was to attract wildlife, they focused on species rather than cultivars. “You don’t know what you’re breeding out and what ecological functions you’re impairing” if you use a hybrid or cultivar, Howard said. For instance, he said, monkeyflowers bred or selected for larger, more colorful flowers are less attractive to hummingbirds than the ones found in nature. But, he noted, ceanothus and salvia cultivars seem to be as full of insect life as the species. Heteromeles arbutifolia, Myrica californica, Ceanothus ‘Dark Star’, Ribes sanguinium, Salvia spathacea, Nassella pulchra, Eriogonum giganteum, Asarum caudatum, and Satureja douglasii. “We couldn’t believe how quickly” and how many birds found the garden, he said. Birds came “instantly” when native plants were installed, and they noted a “huge increase” after adding a water feature. Following Audubon Society recommendations, the water feature was placed within 10 feet of a shrub where birds could seek cover to elude predators. There’s “always something going on in the yard,” he said. Bushtits, for instance, will take 40 percent of the bugs in a mature shrub. California towhees especially like purple needlegrass seeds. He’s observed a Townsend’s warbler eating caterpillars from hummingbird sage plants and robins resting under yellow lupines. At least 37 species of birds visit the garden. Though crows, jays, and ravens populate the neighborhood, they don’t come to this garden. The biggest single task was to improve drainage in the backyard. The Howards rented an electric pavement breaker to cut the tons of concrete into slabs, many of which they dry-stacked into raised beds and used for stepping stones. For the rain garden, they dug a hole and filled it with cobble-size concrete chunks and then gravel, topped by geotextile. The rain garden has successfully let rainwater soak into the soil onsite rather than pooling or flowing into the street. Jim Howard offered some advice for others contemplating an ecosystem restoration garden. Stick to natives. Native plants are the best food source for native insects and other wildlife. Go for complexity of structure, flower color, and flower type. Use shrubs, trees, groundcovers, and perennials that offer a range of habitat niches. A variety of flowers will attract different pollinators. Learn as you go. “You could spend a lifetime investigating what to do and know less than when you started,” he said. Don’t be afraid to experiment. Female Hooded Oriole on Elderberry shrub. Tanya Kucak (tanya.garden@gmail.com) gardens organically. Enjoyed this article, and would like to try gardening with native plants in the suburbs of Stockton, CA. Can you tell me if there is any source for native plants and seeds by mail? Annie’s Annuals ships out 4 inch pots of a variety of plants, natives included. When you go to the website: http://www.anniesannuals.com/plt_lst/lists/general/lst.gen.asp?catagory=3 if you don’t land on the page with native plants, just click on Totally Useful Plant Lists, then click California Natives. The ones that say Add to Cart below them are available. You can also put them on a wishlist. I usually buy 8 plants at a time, which is the smallest shipping fee of $13.95. This is a map where you can find your local chapter of California Native Plant Society. This is a list of native plant nurseries. I am sure there are some in your area; I’m not that familiar with the location of Stockton, but I’m sure you can find it. Feel free to email me at joydevito@comcast.net. A source for native seeds collected in and around the Central Valley is Hedgerow Farms in Winters, CA. Their website is http://www.hedgerowfarms.com. They carry inland species and ecotypes which are adapted to the greater temperature ranges in interior CA. Larner Seeds is in Bolinas. They stock some interesting species, but almost all are collected in western Marin. A wonderful nursery for native plants is Cornflower Farms in Elk Grove, CA. : http://www.cornflowerfarms.com. 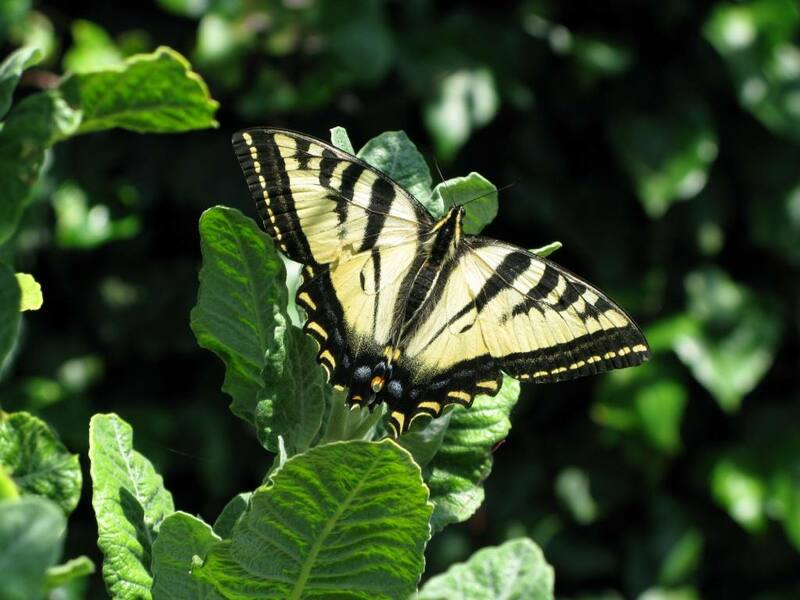 There are also 3 small native plant nurseries in and around Placerville. Visit http://www.eldoradocnps.org for more information on them. I found this article very interesting. I had never heard of a rain garden. We have just converted our front yard to xeriscape. Because we have clay soil and live in the desert, we have installed french drains to direct water flow from the low spots in the backyard and from the roof to water the tree we planted in the front yard. Neighbors on both sides seem to overwater. We will irrigate the tree using the drains. I have just planted some wildflowers, and plan to install a drip system there. So, we will see how the garden develops over time. I think it’s important to plant locals. If you plant seeds of non-local plants, the introduced plants may cross-pollinate with the locals, thereby leading to a loss of the genetic uniqueness of the locals. Plants of the same species do differ genetically. For biodiversity’s sake, we should try not to cause any losses of what nature has allowed to flourish over the ages.